When we talk about painless dental implant placement we talk about a procedure which is done under local anesthesia. Local anesthesia is injected, and for patients who suffer from fear of needles we can use special paste which can be applied to the tissue in order to soothe and relieve it from pain during injection of the local anesthesia. The patients feels no pain impulses during the whole procedure. Placement of dental implants is done by an oral surgeon. 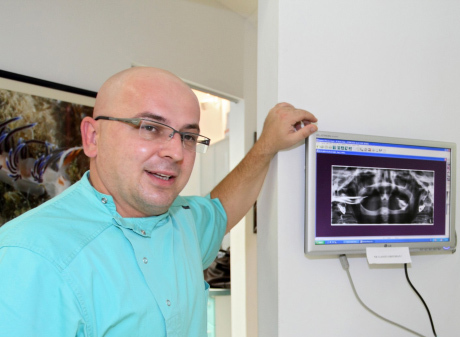 Dr. Daniel Spehar is our chief oral surgeon who leads our team of dental implant experts. 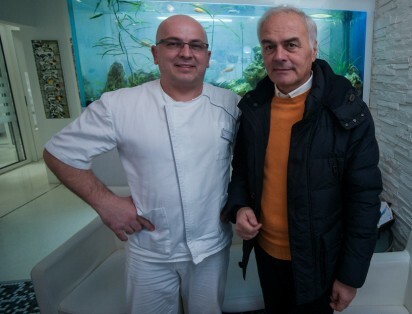 He is one of the best oral surgeons in Europe and has, so far, successfully placed more than 15.000 dental implants. Our implantology team is one of the most successful and most appreciated ones in this part of Europe. It usually takes approximately 10 – 15 minutes to place one implant, but that varies from patient to patient. One should also take into consideration the time necessary for the injection of local anesthesia to take effect. The implantologist will not start with the procedure until the patient gives him a clear confirmation that the anesthesia works and he cannot feel any pain. In most cases implants are placed during only one visit to the dentist, but if it's necessary to graft or transplant a bone, two or more visits are required. Once the anesthesia starts having an effect and the patient doesn't feel any pain, the oral surgeon opens the patients gums with a small incision to expose the jawbone. After that he marks the spot where the implant will be placed with a small drill and uses special instruments to check the accuracy of the position. If everything is OK he starts expanding the position, after which he rechecks the angle and accuracy. When he is sure that everything is in order he continues to expand the final position for implant placement with a new drill. Then he places a temporary implant for a final confirmation of position, places the final implant and uses special instruments to anchor it. After the implant is placed, a special cap is placed on it to close and protect the implant from gums and other tissues. The oral surgeon stitches the opening in the gums using a special self absorbing sutures which will be absorbed after 7-10 days and it is therefore not necessary to extract them from the gums. Dental implant placement is a completely safe procedure if done by a specialist of oral surgery. Like with all medical procedures complications are possible, but they are very rare and happen in less than 0,01% of implant placement cases. If complications arise, they can often be easily dealt with. Percentage of successfull dental implant placement is very high. 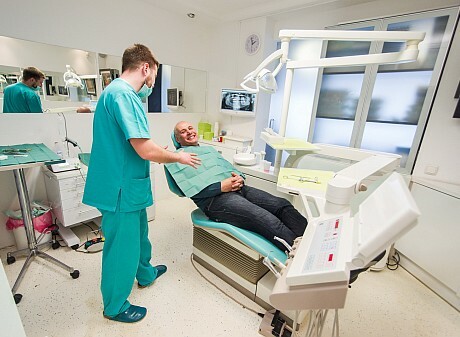 Millions of dental implants are placed worldwide every year with a success rate of 99%, while our implantology team has a far greater success rate of 99,58% .